Click to enlarge. Reconstruction made with STK. 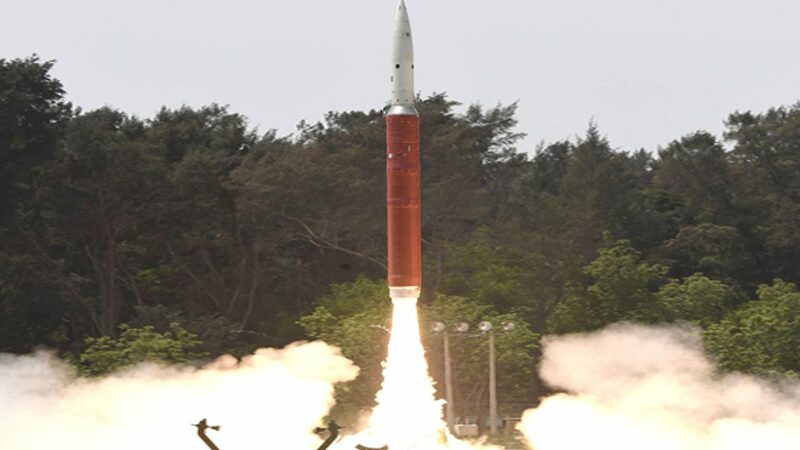 The Indian Prime Minister Narendra Modi made a surprise announcement in the morning of 27 March 2019, claiming that India conducted an anti-satellite (ASAT) test that night under the codename "Mission Shakti". In the hours after the announcement, some sparse details appeared in Government statements and the Indian press: these included that the launch of the interceptor took place from Abdul Kalam island on the Indian East Coast, and the target was intercepted at an altitude of ~300 km. The missile used was a three-staged missile with two solid fuel boosters. 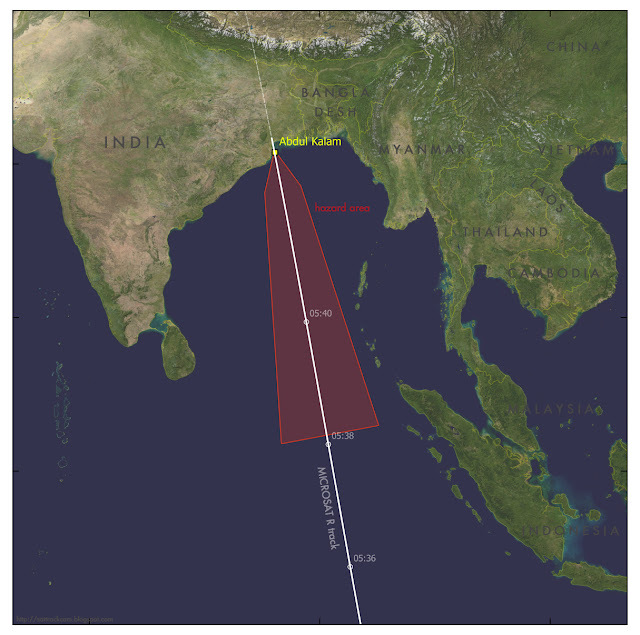 The target satellite was not identified, other than that it was an Indian satellite. T.S. Kelso, @Dutchspace on twitter and myself were however able to identify the target as being likely Microsat-r (2019-006A), a 740 kg Indian military satellite launched two months earlier, on 24 January 2019, on PLSV-C44 from Satish Dhawan Space Centre. We were also able to determine that the test must have happened near 5:40 UT (27 March 2019). 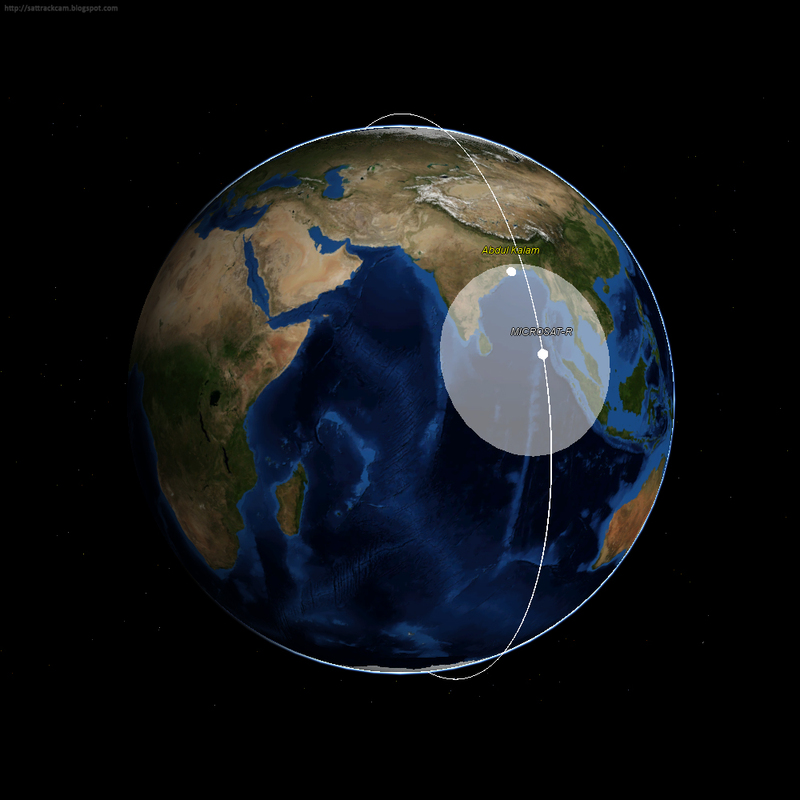 There are only two Indian satellites that fit an orbital altitude of ~300 km: Microsat-r (2019-006A) and Microsat-TD (2018-004T). Of these, Microsat-r was in a very low orbit (roughly 260 x 285 km). 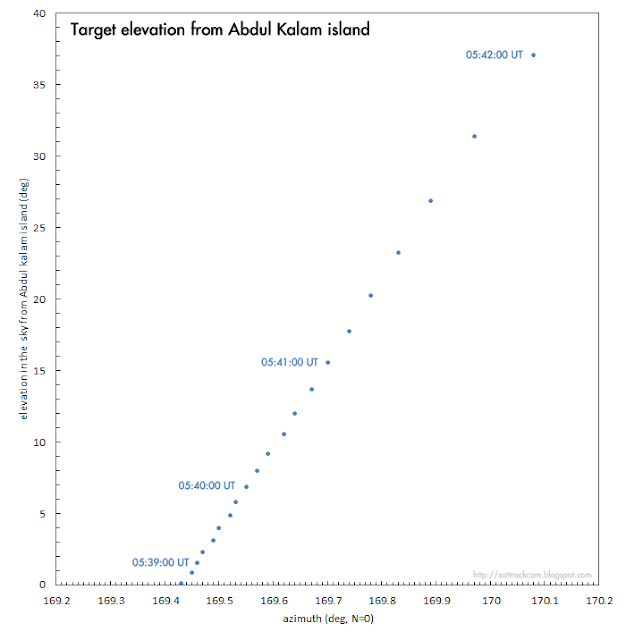 It would also pass right over Abdul Kalam island around 5:42 UT on 27 March 2019. Authority: NAVAREA VIII 248/19 221002Z MAR 19. The fit shows that the intercept might have occured near 5:40 UT, give or take a few minutes, at 283 km altitude while Microsat-r was northbound moving towards Abdul Kalam island. The fit to the hazard area is excellent. 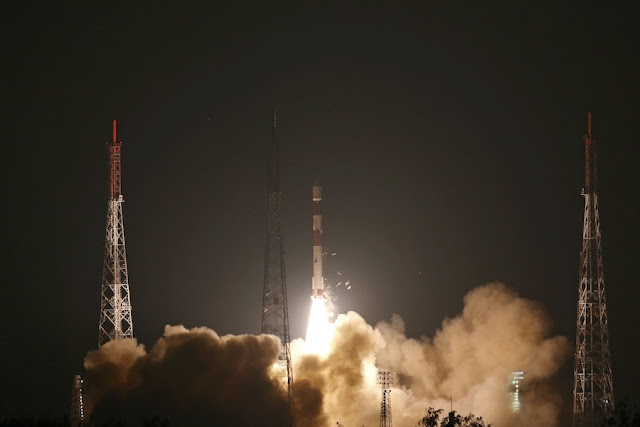 Microsat-r was launched by PLSV-C44 on 24 January 2019, ostensibly as a military earth observation satellite. The satellite was initially in a 240 x 300 km orbit but manoeuvered into a more circular, less eccentric ~260 x 285 km late February. 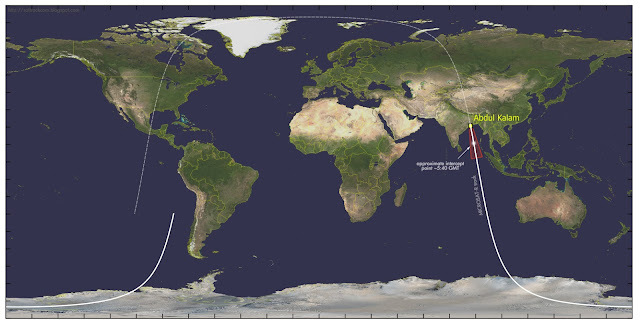 With this ASAT test, India joins a very small number of countries who have shown to have ASAT capabilities: the USA, Russia, and China. The test will certainly cause uneasiness with several countries and provoke diplomatic reactions and condemnation. This is technology many countries do not like to see proliferate, and testing ASAT weapons in space is widely seen as irresponsible, because of the large number of debris particles it generates on orbit, debris that can be a threat to other satellites. Our modern society is highly reliant on satellite technologies, so any threat to satellites (either from ASAT test debris, or by deliberate ASAT targetting) is a serious threat. In this case, because of the low altitude of the target satellite, the debris threat will be limited (but not zero). Few satellites orbit at this altitude (the ISS for example orbits over 100 km higher). The vast majority of debris generated will quickly reenter into the earth atmosphere, most of it within only a few weeks. But previous ASAT tests like the Chinese Fengyun 1C intercept in 2007 and the USA's response to that, "Operation Burnt Frost" destroying the malfunctioned spy satellite USA 193 in 2008, have shown that a few debris pieces will be ejected into higher orbits, so even at this low altitude the danger of such a test is not zero. Nevertheless, the Indian government seems to have learned from the outcry following China's 2007 test, and they specifically point out the lower altitude of their intercept target, and the lower risk stemming from that. As to the "why" of the test, there are several answers, some of which can be read in this excellent twitter thread by Brian Weeden. One reason is military posturing towards China. Another one, as Brian points out, is the current emerging call to restrict ASAT tests: India perhaps wanted to have a test in before these calls result in international treaties prohibiting them. Last but not least, the test could perhaps also be a first step towards an anti-ballistic missile system. [edit 30 Mar 2019: ] India already tested an anti-ballistic missile system before, and this can be seen as a next step in building such a missile defense system. In the press, on twitter and in a message on the Space-Track portal, CSpOC has indicated it is now tracking more than 250 debris pieces from the ASAT test. So far, no orbital elements for debris pieces have been released however. They also confirm the time of the test as 5:39 UT. In this article, it is indicated that the launch and intercept was detected by US Early Warning satellites, i.e. 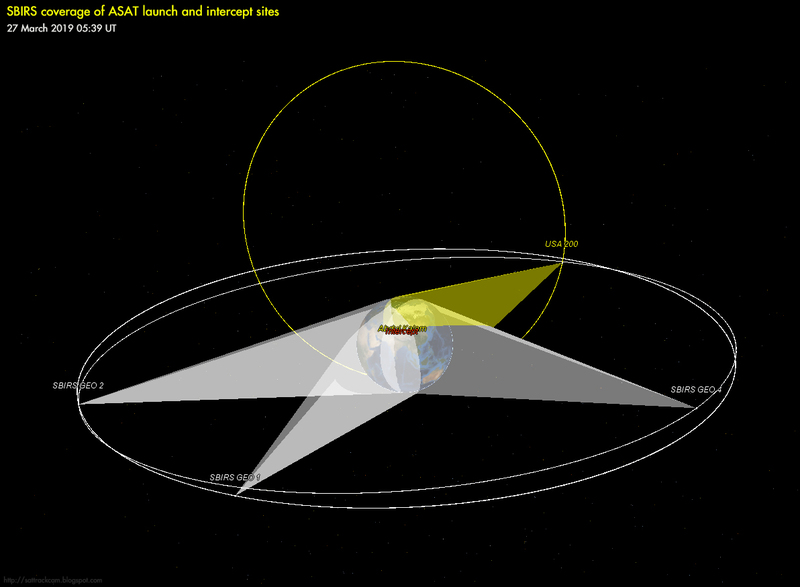 the SBIRS system of infrared satellites that has been discussed several times previously on this blog. 05:39 UT corresponds to the time the satellite first appears over the horizon as seen from the interceptor launch site at Abdul Kalam island: theoretical appearance over the horizon as seen from that site was at 05:38:38 UT. So I assume the 05:39 UT time corresponds to the moment the interceptor was launched after first detection of the target (assuming a detecting radar located on the launch site), at a range of 8700 km. Indian sources say the intercept, from launch to impact, took 3 minutes. 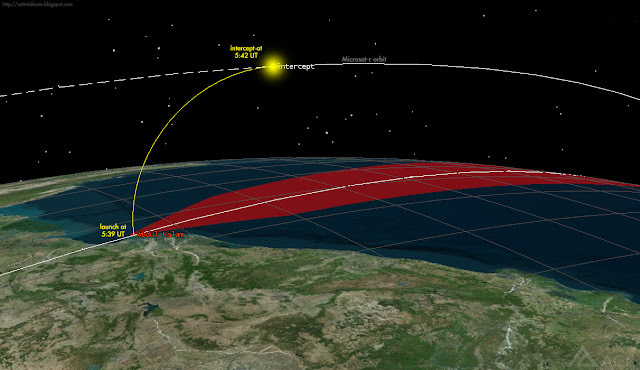 This would place the actual intercept at ~05:42 UT, near 17.68 N, 87.65 E, at an altitude of ~283.5 km and a range of ~450 km from the launch site. 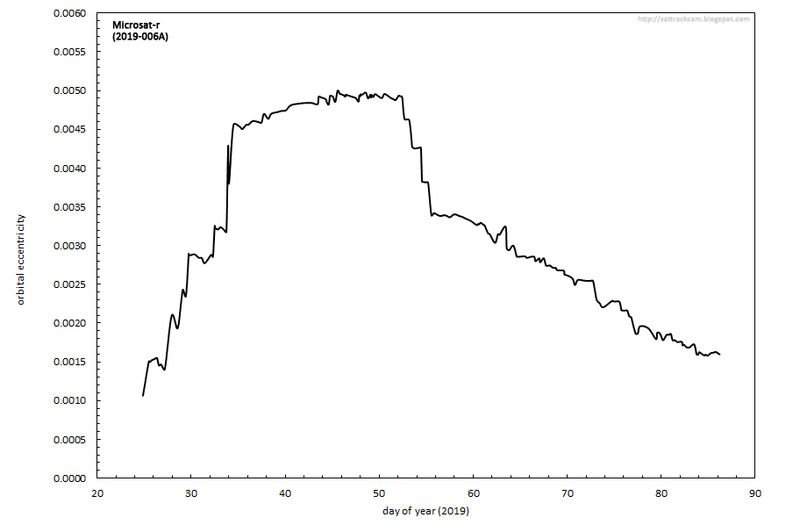 Note (31 March 2019): a follow up post discussing likely orbital lifetimes of fragments created, can be read here. 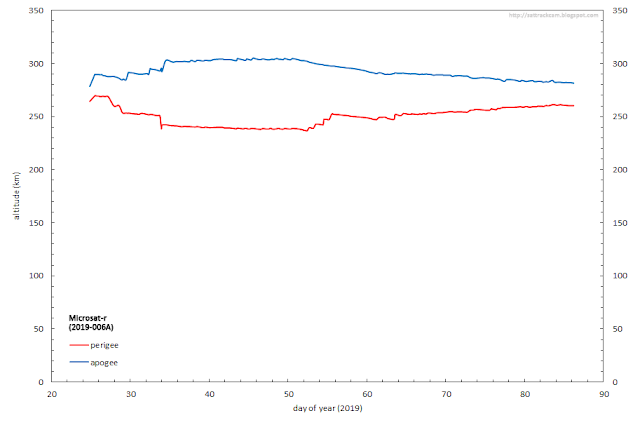 Note 2 (2 April 2019): a second follow up post discussing an earlier failed attempt on February 12, can be read here. India already tested a ballistic missile defence which it tested in 2010.